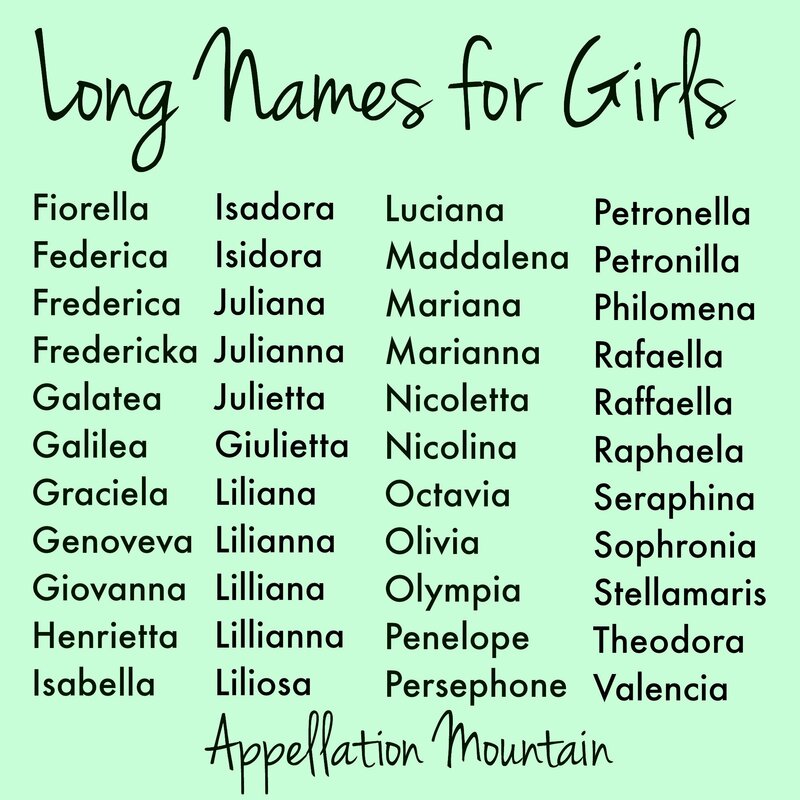 Plenty of parents love long names for girls. Not all parents, of course. For every Isabella, there’s a Mia. But long names have their fans. Ariana, Penelope, and Valentina are all fast-rising choices in the US. Nick Turner’s post at Nameberry puts some numbers to the trend. Also interesting? A girl named Elizabeth isn’t necessarily Betsy or Liza or Liz. Increasing, she’s just Elizabeth. The same is true for Olivia, Eleanor, Alexandra, and lots of other names that once would have been automatically shortened. 2014 saw high profile birth announcements for girls named Alexandria and Elizabella – both names that take a regal classic and amp up the syllable count. And let’s not forget Esmeralda, a graceful, literary name that’s almost sure to find new fans after the birth of Eva Mendes and Ryan Gosling’s daughter. 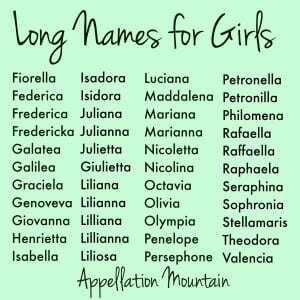 So which long names for girls are the longest? Which seem most wearable? Or are some of these just too much to consider? 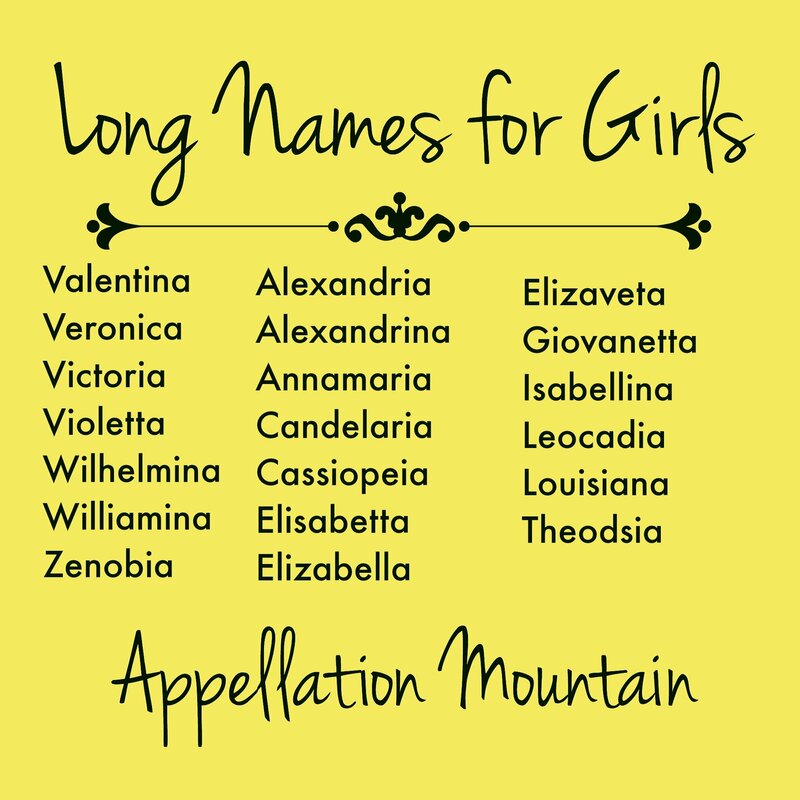 Read on for a long list of long names for girls – and please share your favorites in the comments! Adalina, Adelina – Sweet Adeline – and Adelyn, Adalynn, Adalyn, and other spellings – are on the rise. No surprise, then, that Adelina has her fans. Variant spelling Adalina has yet to crack the US Top 1000, but seems like a perfectly possible variant. Alabama – Rare as a given name, Alabama has been worn by two fictional characters: the main character from Zelda Fitzgerald’s only novel, and the heroine of cult classic True Romance. Alethea – Alethea comes from a Greek word meaning truth, but it has only been in use as a given name for a few hundred years. Alethea had just one tiny moment of popularity, back in the 1970s when popular television series Kung Fu included a character by the name, played a young Jodi Foster. If Sophia and Athena are stylish, why not Alethea? Amaryllis – Plenty of flowers fit into this category, but I think Amaryllis is among the more wearable, even at four syllables. Amaryllis beats Chrysanthemum, at least. Annabella, Arabella – Annabelle is more popular than Annabella, but there’s no reason parents couldn’t add an extra ‘a’ to the ending. Arabella may have started out as a form of Annabel, but is a separate name today – and one that’s nearly as popular as Annabelle. Annalisa, Anneliese – Strictly speaking, Anneliese is pronounced just like Annalisa – four syllables. But American parents appear to favor Annalise – just three. All forms of the name are currently on the rise. Antonia, Antonina, Antonella – Many pronounce Antonia with just three syllables, but it is possible to extend it to four – and Antonina and Antonella definitely tip the syllable scale at four each. Araceli – Araceli means “altar of the sky,” as in Maria de Araceli, the patron saint of Lucena, in Spain. It’s been used in the US since the 1960s. Araminta – Araminta feels like a Victorian concoction, but the name was actually coined in the late 1600s for a William Congreve play. It’s been used sparingly ever since, including a minor figure in the Harry Potter series. Ariana, Arianna – Wildly popular in both spellings, and now boosted by Nickelodeon starlet turned pop sensation Ariana Grande, Ariana/Arianna is yet another four-syllable name rarely shortened. Ariella – Disney boosted Ariel with The Little Mermaid in 1989. Ariel is a Hebrew name meaning “lion of God,” used by Shakespeare for a sprite in The Tempest. Ariel is gender neutral, but Ariella takes this name into frilly, feminine territory. Adriana, Adrianna – Like Ariana, this name is equally popular as -ana or -anna. Anastasia – Anastasia might belong on the five-syllable names list – except nearly every American English speaker I’ve ever met says stay szha, not stay SEE ah. A Romanov princess, an animated musical movie, and her elaborate vibe mean that Anastasia has her fans. Possible short form Stacy is squarely in mom-name territory – thank you, Fountains of Wayne, but I like Ana better anyhow. Avalina, Avelina, Evalina, Evalena – While some of these names have independent roots, they all feel like inventive spins on Ava, Eva, or Eva. 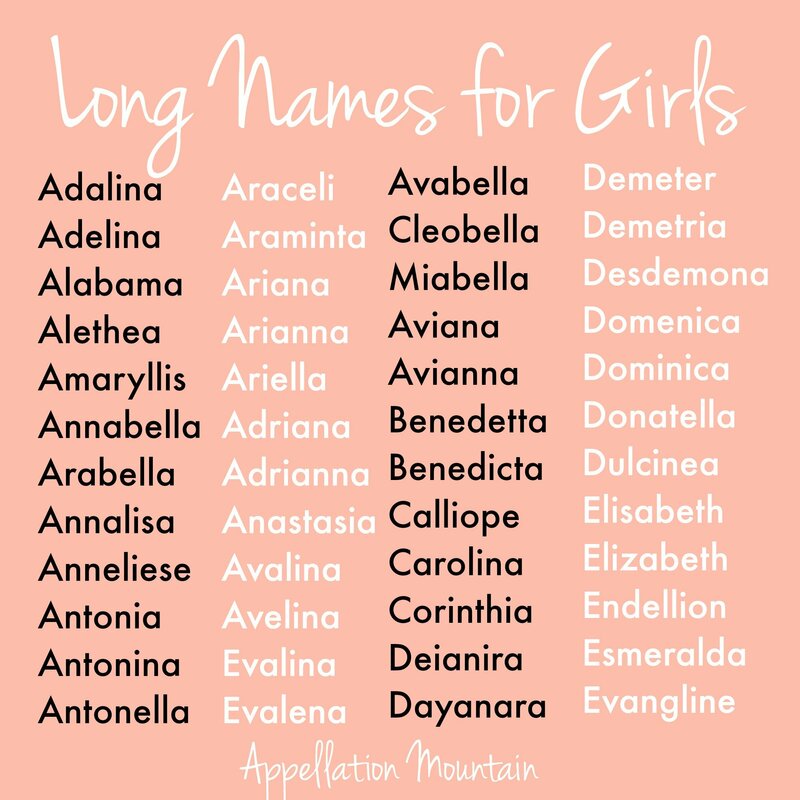 Avabella, Cleobella, Miabella – Smoosh names have a long history of use, and with Isabella in favor, other ends-in-bella names feel like possibilities in 2015. Aviana, Avianna – Aviana makes the list thanks to Amy Adams’ daughter Aviana, born in 2010. Benedetta, Benedicta – Both names are feminine forms of Benedict, as in the pope and the actor. I think Benedetta might be the more appealing possibility. Calliope – Move over, Penelope! There are plenty of Greek long names for girls that share your best qualities: easy nicknames, the fun ‘e’ ending, and a great story. Carolina – Charlotte and Caroline are both in the US Top 100. This feminine form of Charles has also seen some use. It feels Southern, thanks to the US states, as well as high fashion, thanks to Venezuelan-born fashion designer Carolina Herrera. Catalina, Catarina, Caterina, Katarina, Katerina – Regal, saintly Katherine has an almost infinite number of variants, many of which boast four syllables. The Spanish Catalina is especially romantic, thanks to the California island. Cordelia – Lear’s loyal daughter has a lovely name. With Cora on the rise, it’s time for Cordelia to re-enter the US Top 1000. Cornelia – Simcha Fisher just named her tenth baby Cornelia Roxane, and me? I’m smitten! I’ve always preferred Cordelia, but Cornelia does have the potential nickname Nell. Deianira, Dayanara – Hercules had a wife named Deianira. Dayanara might be a modernized spelling, or it could be a creative coinage. Not to be confused with Game of Thrones‘ Daenerys, though now that I say them all together, there are an awful lot of shared sounds! Demeter, Demetria – Demi Moore put her unusual, short given name on the map in the 1980s. Two possible longer forms exist: the goddess name Demeter, and the more familiar Greek feminine form, Demetria. Desdemona – Othello’s doomed love Desdemona was given her name by Italian poet Cinzio. His 1565 work Un Capitano Moro is believed to be the basis for Shakespeare’s Othello. It’s a long name, and because it literally means ill-fated, it hasn’t found many fans. And yet, a negative meaning doesn’t always doom a name. Think of Mallory. Domenica, Dominica – I’m partial to Domino, but Domenica and Dominica feel like more conventional feminine forms of the saintly Dominic. Donatella – As in Versace, and Donna Moss, The West Wing character. Derived from the Latin donatus – given. Donatello is more familiar, thanks to the Renaissance sculptor. And the Ninja Turtle. Dulcinea – Don Quixote’s beloved, and the name of a Toad the Wet Sprocket album from 1994. Shortens the oh-so-sweet Dulcie. Other elaborations, like Dulcibella, have history, too. Elisabeth, Elizabeth – Elizabeth is a venerable classic, and Elisabeth is just slightly different form. Both feel classic and enduring, and also quite long. Endellion – This name made headlines when British prime minister David Cameron and wife Samantha welcomed daughter Florence Rose Endellion. Samantha delivered earlier than expected, while the family was on vacation. Endellion is a Cornish saint, and honors the place of the youngest Cameron’s birth. Esmeralda – The Gypsy darling of The Hunchback of Notre Dame peaked around the time Disney’s musical movie was released in 1996. Thanks to the Mendes-Gosling baby in 2014, Esmeralda is sure to attract more attention. Bonus? Possible short form Esme. Evangeline – A romantic Eve- name quite popular in recent years. Fiorella – Fiery Fiorella actually comes from the Italian word flower – fiore. A promising alternative to the oh-so-popular Isabella. Federica, Frederica, Fredericka – All feminine forms of Frederick, and every bit as wearable as Alexandra. Plus, Freddie is sweet and sassy on a girl, a sister for Sadie. If Francesca is stylish, Frederica could be, too. Galatea – A name from Greek myth, Galatea was later given to Pygmalion’s living statue. Graciela – In Spanish, Grace becomes Gracia. And Gracia can be elaborated to Graciela. 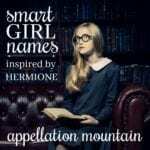 One-part virtue name, one-part long names for girls. Genoveva – The French Genevieve is having a good run, so why not the Spanish form? Giovanna – An Italian feminine form of John, sometimes spelled Giavanna in the US. Henrietta – Sassy Hattie and Hettie fit right in with Sadie, but they started out as short forms of Harriet and Henrietta – feminine forms of Henry. Isabella – Terribly popular, yes. But a lovely name with a rich history, too. Isadora, Isidora – Several saints have answered to forms of this name, but it’s most famous thanks to dancer Isadora Duncan. Juliana, Julianna – Julia is the venerable classic, from the ancient world by way of plenty of distinguished women. Juliana is frillier, but just as enduring. Julietta, Giulietta – Julianna has the feel of a classic, and Juliet is forever tied to Shakespeare’s tale of young love. But Giulietta – an Italian diminutive form of Giulia – and Julietta – are rarities in English. Liliana, Lilliana, Lilianna, Lillianna – Choose your number of Ls and Ns, and this long name for Lily is one that will feel quite current today. Liliosa – Another Lily name, this one borrowed from a Spanish saint. Luciana – Lucy and Lucia are shorter, but Luciana is just as lovely. Maddalena – Madeline – pick your spelling – maxes out at three syllables. But the elaborate Italian Maddalena turns it up to four. Mariana, Marianna – Mary Anne is simple and sweet, while the elaborate Mariana is a more romantic possibility. The Mariana Trench, located in the Pacific, is the deepest part of the worlds’ oceans. Nicoletta, Nicolina – Nicole is a modern classic, slightly French and undeniably familiar. These forms aren’t rarities, but if you’re after an elaborate Nic- name, they might work. Another possibility? Place name Nicosia. Octavia – A possible substitute for Olivia, Octavia refers to the number eight. Perfect for your eighth daughter – or, more practically, a daughter born in August. Olivia – One of the long names for girls that proves four syllables isn’t too many. Made famous by the Australian singer who starred in Grease, but will probably make girls today think of the red-dress-wearing pig. Olympia – Another O name that shares sounds with powerhouse Olivia. Penelope – This name was obscure back when Christina Ricci starred in the fairytale movie by the name. Today, Penelope is a favorite chosen by everyone from Tina Fey to Kourtney Kardashian. Persephone – A lovely alternative to Penelope, rare but not unfamiliar. Petronella, Petronilla – Petra is a feminine form of Peter, along with Petronia. Petronella is an even longer form. The -nilla spelling was worn by an early saint, but I’m partial to the -nella ending, if only because it suggests the short form Nell. Philomena – It could mean loved, or it could mean “friend of strength.” Either way, Philomena has a great meaning. The early saint’s name is obscure in the US today, but if girls can be Francesca, why not Philomena? Rafaella, Raffaella, Raphaela – A feminine form of the archangel’s name. Raphael and all of its variants are on the rise in the English-speaking world, but almost always with the ‘f’ spellings, thanks to the influence of Spanish. Seraphina – Jennifer Garner and Ben Affleck put this unusual name on parents’ radar when they chose it for their second daughter in 2009. Sophronia – Sophronius means sensible, and was the name of a seventh century saint. The feminine form may have first been used in an Italian poem from the sixteenth century. All forms of the name are rare today. Stellamaris – In Latin, Stella Maris means “Star of the Sea” and is a title given to Mary, making this a name rich with spiritual meaning. I’ve come across at least one Catholic church in a coastal town called Mary, Star of the Sea. It’s also a lovely combination, pairing the popular Stella with an unexpected ending. I’ve also seen Adamaris, but I couldn’t track down the name’s origins. Theodora – Theodora means gift of God. Like masculine form Theodore, there’s plenty of history attached to this name. Valencia – A Spanish place name associated with oranges. Valentina – A fast-rising favorite, not just for February babies. Veronica – There’s something quirky about Veronica, as in Winona Ryder’s offbeat character in cult classic Heathers and Kristen Bell’s crime-solving girl detective. Victoria – Regal Victoria is a Roman goddess and a famous queen. But somehow it’s not too much name for an ordinary girl to wear. Violetta – A frilly, romantic, and very wearable elaboration of the botanical violet. Wilhelmina, Williamina – Sure, there’s Willa and Willow. But these feminine spins on William make the long names for girls list. Zenobia – It’s the quirky middle chosen by Tina Fey for her firstborn daughter, Alice, and a Nathaniel Hawthorne character from The Blithedale Romance. If Zoe is too short for you, Zenobia might be one to consider. Alexandria, Alexandrina – Alexandria is an ancient city, and reasonably familiar as a girl’s name. Alexandrina is rare, but there’s at least one notable bearer – it’s the given name of Queen Victoria herself. Annamaria – Take any two-syllable first name, tack on -maria, and presto! Five syllables. Ellamaria, maybe? Avamaria? The possibilities are endless. Candelaria – Candlemas is a traditional Christian feast day commemorating the presentation of the infant Jesus in the temple. Candelario and Candelaria are traditional names associated with the feast in Spanish. They all trace back to the Latin candela, as in our word candle. Cassiopeia – You can find Cassiopeia in the night sky. 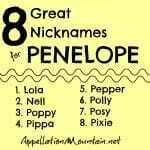 If Cassandra and Penelope are wearable long names for girls, why not this borrowing from Greek myth? 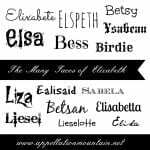 Elizabella, Elisabetta, Elizaveta – Start with four-syllable names Elizabeth and Isabella. Combine elements, borrow foreign versions, and before too long, you’ve reached five syllables. Giovanetta – In American English, nicknames tend to be shorter form of given names. But in other languages, affectionate forms are longer. Giovanetta is an elaboration of Giovanna – but this one might feel too patched together to work in English. Isabellina – Isabelline is a pale yellow-grey color, and a possible four-syllable name for girls. But Isabellina reminds me of Alexandrina – and ups the syllable count to five. Leocadia – Leocadia is a fourth century Spanish martyr, believed to have met her death in Toledo. In French, the name became the shorter Leocadie or Locaie. But Leocadia, in all of her syllables, is the longest form. Francesco Goya also painted a famous Leocadia, possibly based on Leocadia Weiss, a distant relative who served as Goya’s housemaid later in life. Louisiana – A five-syllable place name possibility, as wearable as Carolina or Louisa. Theodosia – Is this four syllables or five? Hard to say, but if you pronounce this one with a “see uh” ending, then Theodosia is definitely among the longest of the long names for girls. How long is the longest name on your girls’ list? Wow, Maristela sounds so much more beautiful to my ears than Stellamaris does, probably because it sounds more Spanish? So many beauties on this list, I adore your site. I have to jot down my faves so as not to forget! I’ve heard Gentiana and Evyenia. Apollonia! Still bummed I could never convince my partner to go for it. My favourite 4s, mentioned: Araminta, Cordelia, Esmeralda, Isidora, Liliana, Theodora, & Veronica. My favourite 4s, unmentioned: Andromeda, Ariadne, Ezriela, Ilaria, Iliana, Luscinia, Mariamne, Melusina, Raziela, Rosario, Remedios, Valeriya, Viviana, Xaviera. I like Elizabeth but not as much as Eliza, and Katarina but not as much as Yekaterina, Katharine, or Katia, so I bumped them. I like short names as much as long names. They flatter each other, too. I don’t really want ten syllables before I get to the last name. I have recently felt that Jaquenetta and Jacobina would make perfect Twin names. They are both 4 syllables, both are button-up-stately classics, frilly, and romantic in look and feel without being obvisously matchy. Jaquenetta could go by Netta/Netty and Jacobina could go by Bina. Adorable! That’s quite the duo – love it, Winter! Oooh I forgot Jacobina. Noew,There a rare 4 syllable name. Gregoria is a neglected 4 syllable name that didn’t even make your list. Even the literary Bradamante, but that one is to be expected. I once knew a spunky little girl by the name of Zahara! I also knew a girl in college named Shoshona. I’d never come across Adamaris as a name before, but I suspect the origin is from Latin adamaris “You are loved”. I really enjoyed this list! One of my favorite long names is is Avhiendha. She is a character in an amazing fantasy book series (Wheel of Time). I love the look and sound of the name, but I also love the character herself. 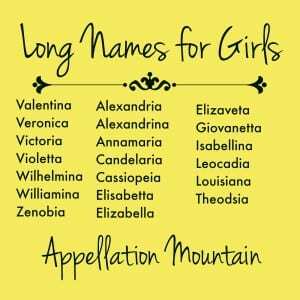 My daughter has one of these long names and does not use the “standard” nickname for it. A risk I know, since both my mother and my best friend are Elizabeths with undesired forced “Liz” shorteners. She got in trouble at a tiny gym once because they kept calling her by the “standard” nickname for her name and she didn’t even hear them. Why people assume you will be called by a given nickname bugs me. Oh I hate that tooo! Everyone assumed that I would go by Winnie or Winner. I just ignored them! When we were trying to conceive our oldest, I was mildly obsessed with finding 3-syllable names with six or fewer letters. I thought three syllables flowed best with our 2-syllable last name but didn’t want to burden a child with a long name to write and spell: Lydia, Cecily, etc. ironically, when it came time to actually name kids, we ended up with one kid with a 2-syllable name and one with a 3-syllable name with 10 letters! Oh gosh, I love them all! Oh how is love to name a little one Stella Maris! Sadly hubby doesn’t like Stella. It hasn’t occured to me that I could smush it. I’m going to see if it Stellamaris could work as a middle name. I’ve seen Maristel(l)a too, so pretty! 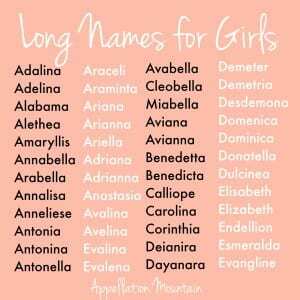 Donatella, Demetria, Evangeline, Fiorella, Liliana, Persephone, Raphaela, Valentina. I prefer Ariane to Ariana, but Oriana is a favourite too.